* It was early afternoon, nowhere near sunset. * My phone was with me. * I now had a pretty good idea of how to change a flat tire. * And the real ‘ace-in-the-hole’ — Brent and our second-born, Greg, were going riding too. So if I did manage to have any trouble they would ride right by me on their way home. And [probably] help me out. I took off first, leaving the guys behind with some bike part to adjust, because I was going to make pizza, and Greg needed to start back to his place in a couple of hours. I would barely have time to bake it and enjoy the subsequent feeding frenzy. Besides, as I may have mentioned, I was better prepared and nothing could possibly keep me from having a successful bike ride. I picked a short but challenging route with some long, slow grades to climb. At the farthest point, I turned toward home and had the thrill of a couple of miles mostly downhill. Ah, time to relax, shift gears to the big chainring, and bump up my speed with little effort! My front derailleur must be equipped with the sort of heavy-duty suspension springs you would normally use in a big-rig truck. With my scrawny little toothpick arms and arthritic fingers, it is all I can do to shift the chain from the normal chainring to the big one. After a try or two, I got the blasted thing pushed over and proceeded to ride fast (for me) to the stop sign beyond the bottom of the hill. Then it was time to shift back down to the normal chainring, since the next quarter mile or so is slightly uphill. Fortunately the beefy, macho derailleur spring is much easier to shift back down than it is to shift up. Um… maybe too easy. With a flick of my wrist, I released the derailleur. Ta-wang! Macho Spring ricocheted the chain clear off the crankset and into the little space between the chainring and the frame, where it stuck tight. Great. A bike wedgie; just what I needed. Simple. Unless, of course, the chain is caught in the worst wedgie ever. 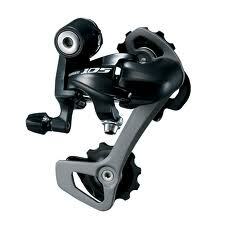 It would take two hands to pull the chain from its trap, which can only be done while one hand is pulling the rear derailleur down. If you do the math, you can see that I was not going to get that pizza in the oven any time soon. After several fruitless efforts, during which both hands became blackened with chain grease, I heard the sound of a diesel motor approaching. Since I was off the pavement and in no danger of being run over, I ignored it. Until it rolled by me and stopped a couple of yards away. It was a white pickup truck, and a man several years younger than myself was getting out. “Let’s see if I can get that loose so you won’t get your fingers greasy,” he offered. “It’s far too late for that, but I appreciate the help,” I assured him, and pulled down the rear derailleur. Even Diesel-Pickup Guy had to give the chain a couple of good yanks, but it finally came free. I was ready to go. Like I said, help would have come along before too long, but now our pizza was a done deal. How about you? Have you ever been a Good Samaritan or been rescued by one? * Little-known fact: this is precisely why bike shorts are usually black, so you can wipe the grease off your fingers without losing any style points. PS: I’m linking up with Jen and the Soli Deo Gloria sisters! This entry was posted in Thoughts on Two Wheels and tagged bicycling, good Samaritan, help, humor, mechanical, strangers. Bookmark the permalink. I was saying a little prayer at the part where the chain stuck. Thank goodness someone stopped that knew about a bike chain. God is good … bet the pizza was good too. Hi, Mom! It’s great to find gentlemen still around. The pizza was superb, if I do say so. Love you! I love pay-it-forward stories. Not as many these days, which makes good guys like this so special. My good times tend to be helping older folks or those with disabilities get things in stores. I always think of my parents and grandparents and hope that if they needed some help for such a simple task, someone would help them. I’m with you… as a tall person, I often have a petite lady ask me to reach something from a high grocery shelf. It feels wonderful to be able to perform such a simple service. Thanks for commenting! When Betsy was a Senior at Cleburne HS she drove a VW Rabbit. She often left the keys in the ignition in hopes that someone would steal it. This car was a diesel and was ugly and rattled a lot. Dad’s “Project” car. He rebuilt the engine and put a new axle on the rear. Cleburne teens were meeting at a country church with other youth groups en route to Ft Worth for a Christian concert. Exciting for the girls! As they rounded a curve the back wheel flew off into pastureland. Betsy held the steering wheel tight and pulled over on the right shoulder. A young man in his “Dually” pickup pulled over and gave the girls a ride to this country church. As Betsy told us about this mishap–a good lookin’cowboy picked them up and the Rabbit died. ARE YOU GIRLS OK? Thanks Lord for Gentlemen that assist us! Thanks Jan! Kathy, what a great story about Betsy! I can’t imagine your shock at her initial description! 😀 Thanks for the comment and story. While I haven’t experienced a bike wedgie yet, I have suffered a flat episode. My knight in shining armour came in the form of a maroon Traverse – fortunately he was only a phone call away! After suffering through crutches and an out of commission shoulder, I try to watch for people who need assistance in the grocery store. If I can reach an item on a shelf that is a small effort on my part to help someone. Yay for knights in shining armor! And you’re right; when we’ve needed help ourselves, I think it makes us more sensitive to other people who need help. Thanks for stopping by, Cindy! I have got to say what a well written story. You had me right in the scene riding with you. Great descriptions. As a good friend once told me, “Things always take more time than you expect.” isn’t that true! I thought this was going to be the story about how you bought gas for someone…glad I popped over to read because once again, you had me smiling all the way. Hey, Jen, A hearty “AMEN” about driving rather than cycling! I’m looking forward to our visit.